Star Trek, its characters, feature films, TV series and merchandise, I acknowledge are sole property of CBS Studios and Paramount Pictures. I am not selling any of my written materials at this time nor am I being compensated in any way through this webpage. I am only seeking to have my written works published under license through Simon and Schuster Inc. as part of the Star Trek Pocket Book series. 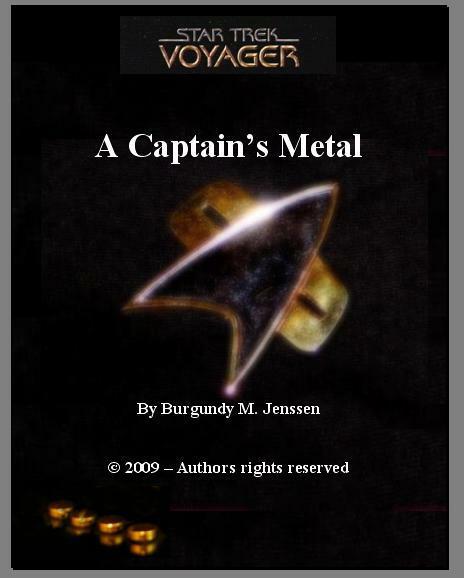 The selected sections from the original written manuscript for the proposed novel "Star Trek Voyagertm: A Captain's Metal" you are about to read are copywrite protected through the U.S. Constitution, Article I, Section 8 and through the laws of the United States (title 17, U.S. Code) . These short sections provided here for your review and enjoyment are the original works of the author, Burgundy M. Jenssen, and can not be copied, duplicated, modified or used for any other purposes without written consent. I will not mislead you. Burgundy M. Jenssen is a "Nom de Plume" or pen name. I have been an avid fan of all of the various Star Trek Series and Movies through out the years. I decided perhaps it might be time for me to try my hand at writing a Star Trek novel in an effort to give back to the medium that encouraged me to pursue a career as a scientist and engineer in my own right. Those are the moments I like to write about in an attempt to fill in the gaps often found in the Canon episodes of the various Star Trek Series we have all come to know and enjoy. Each of us who enjoy the works of Science Fiction and Fantasy often sees parts of our favorite characters in ourselves. That is what makes these characters timeless and enduring. As a writer, it is best to write about those things you know well in order to write a convincing story. Where possible it is also interesting to include bits of facts longside the fiction, just to make the story that much more believable. It is the reader's job to figure out which is which. My experiences growing-up in the farm land of Indiana and being an accomplished Scientist and Engineer in my own right, leads me to write about the characters I find sometimes looking back at me in the mirror as I get ready to go to work in the "Corporate World" each morning. Honestly, it is often a different character each day, depending on the situation I find myself in at that moment. It stands to reason then that logically, I would pick to write about a character that is, in some ways, a lot like myself for a first novel attempt. I, however, do not like coffee, thank you. If my writing allows you continue to laugh, explore and enjoy the Universe of Star Trek along with the characters you have come to know and love, then it has done its job as a form of art and entertainment. If I also get you to think a little bit more positively about your own goals in life and get you to open your mind to explore and appreciate the people, cultures, and the natural, scientific world around you right here on Earth, then I have done my job as a writer.